Gun and flask laid in. One of the first goals – paint all over the canvas – achieved. Some painters work on one area after another. I try to bring it all up at the same time, like a photograph coming into focus in a darkroom. Now taking a break for lunch. As close to done as I could get yesterday, though I’ll be looking at it long and hard later this morning. As I lit candles and prayed for my family and myself, I didn’t know exactly what I was asking for, but it turned out to include a life as an artist, fidelity, and unconditional love. 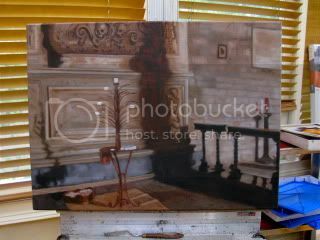 Rocked out on the last painting, the one that’s my answered prayer. Decided to add my dogs – my stand-in for unconditional love – and a jar of brushes. There’s a basket on the lower left that actually held candles, but it looks remarkably like a dog bed. That’s where I’ll place the dogs and next to it the mason jar with brushes. It will be relatively subtle. One of the reasons this image is mine is the shadow that divides the space. Being a Gemini and all, and keenly aware of my dual nature, this speaks to me. 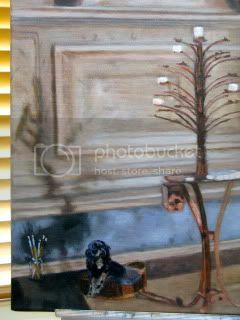 Today I’ll be deepening the darks and adding the dog/jar/brushes. Maybe hanging a triangle from a candelabra arm. 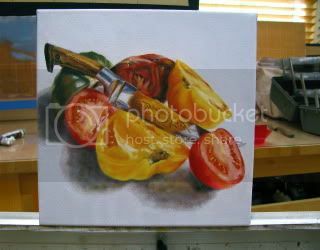 I’ve got four tomato and knife paintings done and four out of five of the Answered Prayers. Showtime is April 13. That’s a Friday. I know, right? Still, lucky for some, as they say. 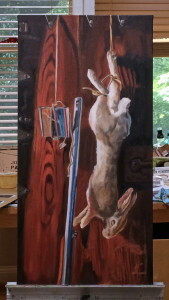 I have exactly seven days to have this finished, dry, varnished and wired. It’s possible. Really. 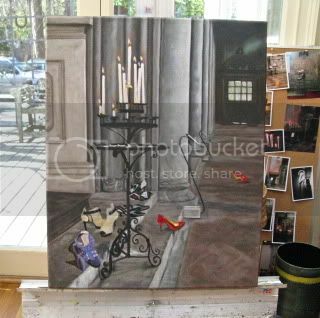 Made darks darker, added a layer to the rug and the stone floor and sharpened the candelabra. One more round of light on the right side wall – not there yet but closer to the value I’m aiming for. Carefully added Moochie and Maddie – scraped the paint off and did it again on a different scale, with only one dog. Better. 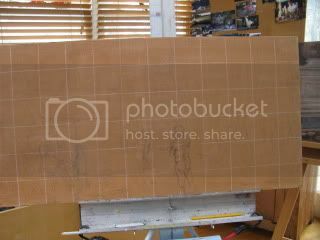 Then added the jar and brushes. Worked wet on wet and fast (for me). Here’s a detail of the new elements. Nearly done with Tomatoes & Uzbekistan Knife. Worked on details and the very important engraving. About half way there, because the knife needed more reflection. Thinking it will be done tomorrow. That’s four down – I signed St Crispian, Quick Draw and Harmonium yesterday – two to go. 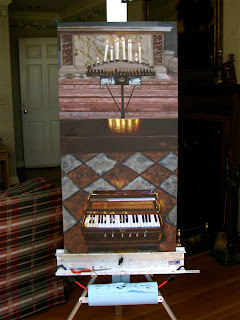 Harmonium’s last day on the easel. One minute I’m chugging along in the studio at a measured pace, one eye on finishing up the series for my next Mason Murer group show, the other on a new triptych that’s in the drawing stages, and Wham. First an email pops up about a Mid-summers Nights Dream Show in June (small works, under $2000, one night only) Sure, count me in. Followed by a letter accepting two of my paintings – Clothe the Naked and Thirsty – for the Decatur Arts Festival fine art show. Yippee. This morning I confirmed the date of the show at Mason Murer, which I had a hazy idea was scheduled for end of April, beginning of May….nope. My paintings are due on April 10th for an April 13 opening. 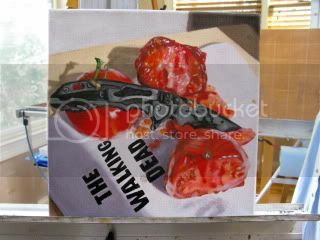 I’m sending three ( maybe four) Answered Prayers) and three (maybe four) of the Tomato & Knives paintings. Yikes! 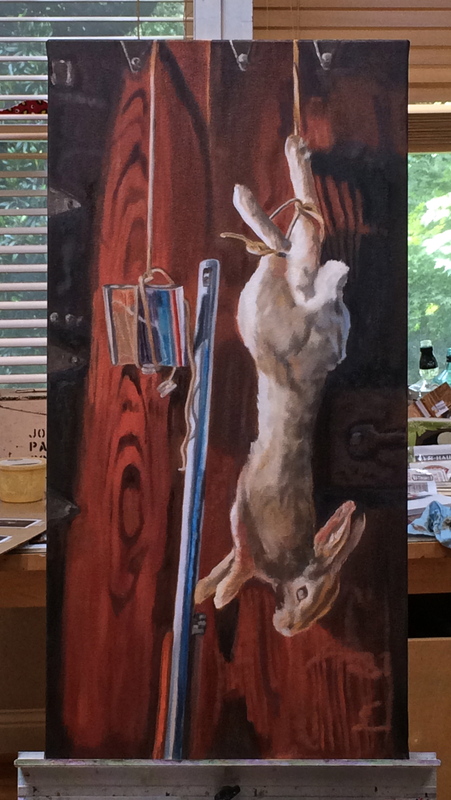 I lunged across my desk to the easel, where I have been moving paint to canvas ever since. I don’t expect to surface from the studio until April 9th. Nothing beats a deadline. It’s shifted the mood of the painting completely. I think my favorites are the Tuxedo shoes in the far background – a wonderfully absurd cross between saddle oxfords and formal wear. 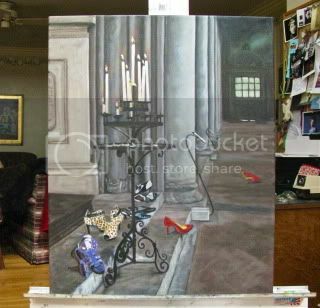 I’ve been unhappy with the Stiletto painting, mostly because I felt the joie de vivre factor was lacking. After due deliberation, I decided it needed more shoes. Daughter kindly brought over the props – two laundry baskets heaped full of her shoes. It took three days of lining up shoes and taking photographs to get it right. It worked out that the only step that was long enough to mimic the step in the church also required me to stand in the thorny embrace of a ginormous climbing rose and lean to the left. The shoe set up changed in form and content many, many times. The sun went down. The sun came out and splotched the step. The camera battery died. The printer choked. I prevailed. I painted the shoe lineup this morning. Nearest to farthest it’s purple suede sandals, peeptoe leopard print ankle boots, patent leather kitten-heeled sling backs, and a pair of stiletto heeled peep toe shoes that mimic a tuxedo shirt with a bow tie. They are just started – the ankle boots need their leopard print, and there are buckles and rivets and shadows yet to come, but you’ll get the idea. I am so so much happier. I went from feeling defeated to positively hopeful. I not only like the way this is true to my daughter’s shoe-coveting heart, but the idea of all the barefoot women running on the stone floors of the church. 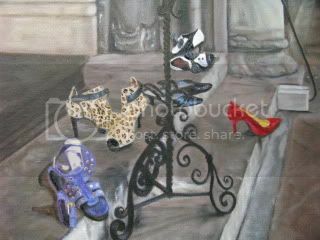 I wonder who the patron saint of shoes is? Pressed onward with Harmonium. Far from complete but it’s beginning to come together. 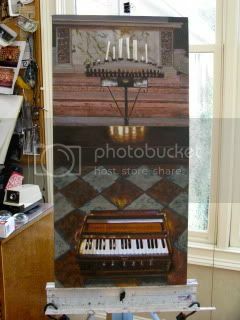 Worked on the the tiles floor and the altar marble today, the harmonium last weekend. Need to take on the marble steps next. 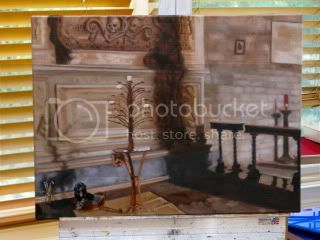 I’ll eventually glaze the candle light reflection using Indian yellow with a touch of crimson. Trying to build enough brightness to shine through it after it’s glazed. 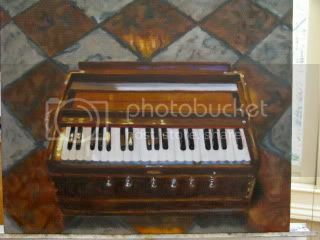 There are myriad gleaming wires in the body of the harmonium that I have yet to place.